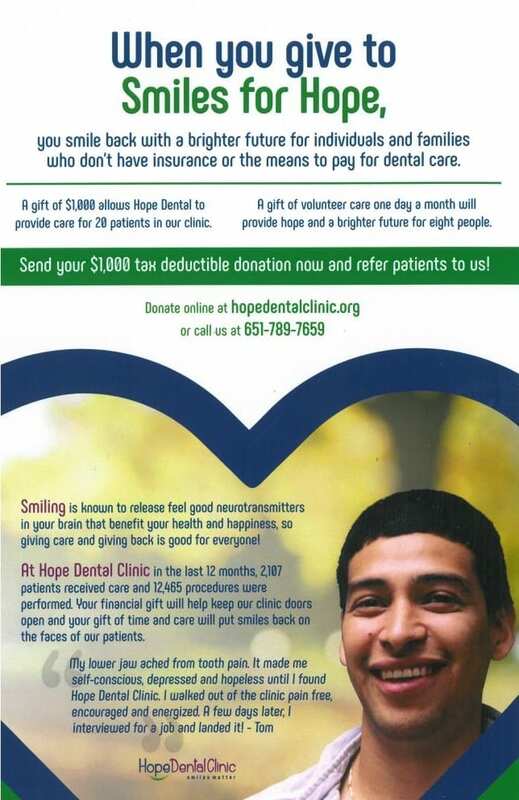 Hope Dental Clinic serves over 2,000 and 250 children each year that are not able to afford dental insurance or their plan doesn’t cover the procedure. Tim Mercure explained Hope Dental has a volunteer staff of more than 60 dentists and as many as 300 volunteer students, and other dental professionals providing cleanings, extractions, fillings, referrals, oral health education, and other services to individuals and families who do not have access to adequate detail care. Eight times per year Hope Dental holds a two-day Metro Area-wide treatment events, Give Kids a Smile and St. Paul Dental Connect. These events are designed to serve large numbers of people in need and make dental care more accessible. They also education over 1,000 school-age children every year on proper oral health care and healthy nutrition through their Mission for Healthy Smiles program.